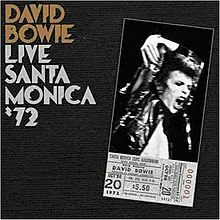 Live Santa Monica '72 is a live album by David Bowie. It was released on 30 June 2008 (2008-06-30) in the United Kingdom and 22 July 2008 (2008-07-22) in the United States. It is the official release of the bootleg album Santa Monica '72, recorded at the Santa Monica Civic Auditorium during the Ziggy Stardust Tour. ^ "NME Album Reviews - David Bowie". Nme.Com. 1 July 2008. Retrieved 28 February 2012. ^ "Rolling Stone Music | Album Reviews". Rollingstone.com. Retrieved 28 February 2012. ^ admin (21 November 2008). "Ask Billboard: Girls Aloud, David Bowie, Brits". Billboard. ^ "Live in Santa Monica '72". allmusic. Macrovision Corporation. Retrieved 5 July 2008. ^ David Bowie. Live Santa Monica '72 (EMI, 2008).